Analysts believe that if lots of PLA’s Gaoxing-6 (GX-6) are commissioned, the era of US submarines’ free movement will end. 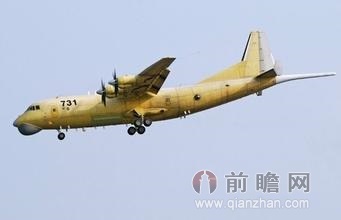 China’s GX-6 uses 4 turboprop engines, that consume less fuel and are suitable for long-distance medium-speed (800 to 900km/h). 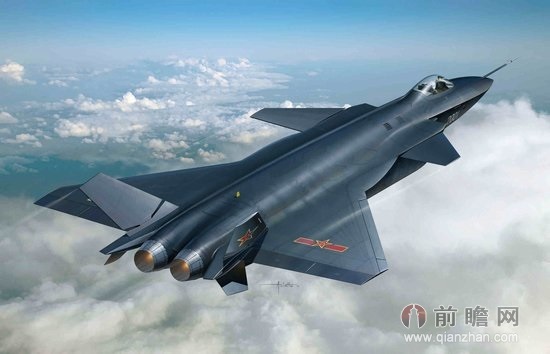 Sources say: GX-6 weighs 61 tons and has a wingspan of 38 meters and cruise speed of 660km/h. Built on Y-9 transport, it is equipped with a 360 degree full view search radar and a very long “tail sting”, a special MAD for detecting submarines under water. It can not only detect submarines, aircrafts and warships but also carries air-to-air missiles, depth charges, naval mines and/or anti-submarine torpedoes to directly attack them. Recent analysis by US defense experts finds that GX-6 will perhaps enable China to catch up and put an end to its anti-submarine inferiority. According to Russian media, great breakthrough has been made in developing China’s homegrown Turbofan-15 Taihang engine to free China from its reliance on Russian engines. 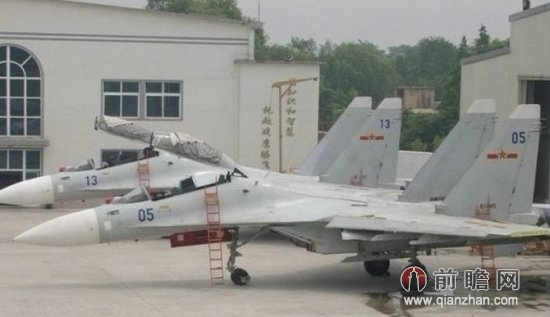 At lease one of the J-20 prototypes is installed with such engines. The engine has been found superior in its greater thrust and its entirely digital electronic control system that fell little behind those produced by the US and Europe. An analyst of US media in East Asia also said that perhaps development of Turbofan-15 engine with a thrust of 18 tons had been finished. China said on Wednesday it had caught five suspected Islamist militants after a vehicle burst into flames on Beijing’s Tiananmen Square in what police called a terrorist attack. Authorities also moved to tighten security in the restive far western, energy-rich region of Xinjiang, where the suspects are from. The Xinjiang-registered SUV involved in Monday’s incident in which five people were killed was driven by Usmen Hasan, police said, a man whose name suggested he is an ethnic Uighur, a Muslim people from Xinjiang. His wife and mother were with him in the car, along with devices filled with gasoline, knives and a flag with “religious extremist content” written on it, police said on their official microblog. The vehicle ploughed into pedestrians in the square, which has drawn occasional protests since 1989 pro-democracy demonstrations were suppressed by the military. Sources earlier told Reuters it was a suspected suicide attack. “Police have identified Monday’s incident at Tiananmen Square as a violent terrorist attack which was carefully planned, organized and premeditated,” police said, adding the three people in the vehicle died after they set the gasoline on fire. The other two people killed were tourists. At least 38 people were injured. 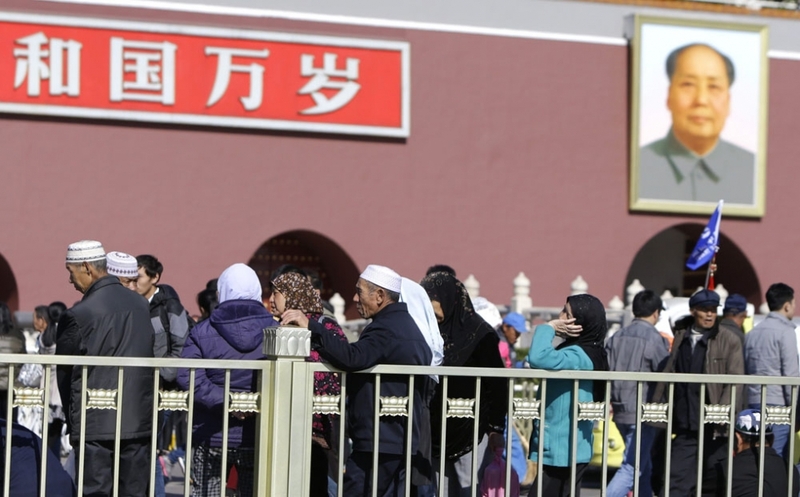 Five people connected with the incident were caught just 10 hours after the attack, with help from the Xinjiang government, the police added, all of whom also have names that suggest they are Uighur. Police said they had seized Islamist militant flags and knives from where they were staying. As authorities stepped up already-tight security in Xinjiang, Dilxat Raxit, a spokesman for the main exiled Uighur group, the World Uyghur Congress, warned against believing China’s side of the story. “Beijing has always made these kind of accusations, but they refuse to make public the reasoning behind them. They will not make the story behind the accusations transparent,” he told Reuters. Raxit said he was worried the incident would provide authorities with an excuse “to further repress Uighurs”. The government denies accusations of repression. It insists its respects the region’s people and traditions and blames separatist Uighur militants for provoking violence in Xinjiang, which borders the Central Asian states of the former Soviet Union as well as Afghanistan and Pakistan. Reuters reporters in Xinjiang were turned back by police at a roadblock outside Lukqun town, and sent back to the nearby city of Turpan. Police have identified one of the caught suspects as being from Lukqun, where 35 people died in June in what China also termed a terrorist attack. “We have some police matters we are handling. For security reasons, you are not allowed in. I imagine it will be at least another month or two before this area is open,” a police officer at the checkpoint said. In a small village near the checkpoint, a young Uighur man who declined to give his name said people were afraid. “In the past few days, the police have been everywhere. At night, the sirens were all around. We are afraid to speak. If you speak, you will be taken away or shot,” the man said, making a pistol shape with his hand. Xinjiang is home to the Turkic-speaking Uighurs, many of whom chaff at China’s controls on their religion and culture and there have been violent clashes there in the past. But many experts, rights groups and exiles say China exaggerates the militant threat to justify its harsh rule, and that there is no cohesive separatist or extremist movement. “The footage and photos that have been made available suggest a sense of randomness about the attack even though officials have said it was premeditated,” said Michael Clarke, a professor at Australia’s Griffith University who has studied Xinjiang. An article on qianzhan.com says that foreign media look down on Chinese high tech weapons and regard them as copies of foreign weapons or something based on stolen technology. But the reality is China has an effective second-strike nuclear force. 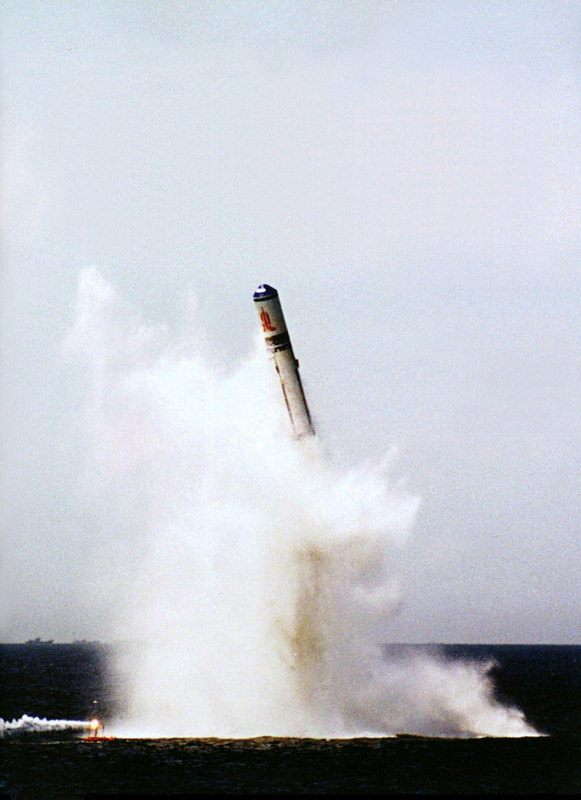 China’s JL-3 SLBM has a range of 14,000 km and 6 to 8 250,000-ton warheads. As one Type 096 nuclear submarine can carry 24 JL-3 missiles with 144 to 192 warheads in all, it can destroy the US three times if a war breaks out between China and the US. China’s official huanqiu.com gave a comprehensive report today on the rare front-page publication of lots of photos, charts and articles about Chinese strategic nuclear submarines in various major official media including the People’s Daily both domestic and overseas versions, PLA Daily, Chinese Youth Daily and Guangming Daily. Chinese nuclear submarine unit has been established for 42 years now. It was not an occasion of the 10th, 20th, 30th or 40th major anniversary of the establishment of the unit. The sudden breaking of the strictly guarded mystery about the unit really puzzled analysts. 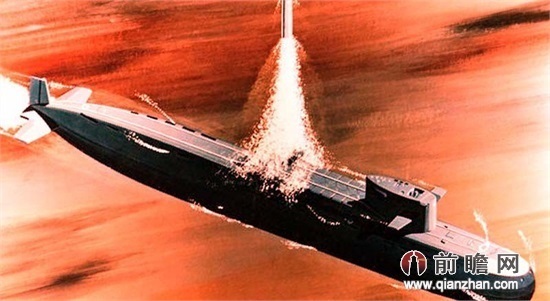 In the report, huanqiu.com hailed the successful development of China’s submarine strategic second-strike strength in addition to its mobile ICBMs hidden in tunnels and openly regarded it as a nuclear deterrent against the US. However, the revelation a few days before Chinese President Xi Jinping’s meeting with US President Obama amid grave tension between China and Japan gave people the impression that China wanted to warn the US that it had nuclear weapons to counter US intervention in a war between China and Japan. The impression is especially true taking into account of the preceding revelations of the accuracy of China’s DF-21D missile and the superb stealth performance of China’s fleet of more than 80 Type 022 stealth fast speed missile boats, both of which are regarded as aircraft carrier killers. Obviously the latter revelations plus the revelation of Chinese nuclear attack submarines’ capability in simultaneously launching several torpedoes constitute China’s attempt to show the US that it has deterrent against the US in a conventional naval war near China. However, the revelations at least indicate China’s unwillingness to fight a war and hope that the US will tell Japan to restrain itself to avoid a war. There are indeed hardliners in the PLA who advocate fighting a war with the US and inflicting heavy casualty to scare American people. For that purpose, China has to keep those weapons secret, but that is not what China’s wise leaders want to do. By the revelations, Chinese leaders have given clear indication that China wants a peaceful rise. I still believe that the US is able to prevent the war between China and Japan if it clearly tells Japan that if Japan starts the war, the US will not support it. Anyway, the treaty between US and Japan aims at defending Japan instead of helping Japan attack a third country. Beijing police are searching for at least eight people believed to be linked to the apparent suicide car crash in front of the Tiananmen Square gate on Monday afternoon that left five dead and 38 injured. Police set up a special team to investigate the case yesterday. Hotels in the capital have been asked to be on the lookout for the suspects, according to a notice seen by the South China Morning Post and staff at several hotels. The suspects include a 21-year-old Sichuan-born male named Liu Ke. The name suggests the suspect is Han Chinese. His registered address is a residential complex belonging to police in Changji, Xinjiang, an autonomous region known for ethnic tension between Turkic-speaking Muslim Uygurs and Han Chinese. The seven others have ethnic Uygur names and come from Xinjiang, the same police notice said. The notice listed five Xinjiang vehicle number plates, including one of a motorcycle, that are of interest to police. Police said an SUV careened 500 metres along the pedestrian walkway at the northern end of Tiananmen Square, ploughing into dozens of tourists before bursting into flames just after noon. The three people in the vehicle, a male tourist from Guangdong and a Filipino woman were killed. Three other Filipino tourists and a Japanese man were among the injured. While the central government has said little about the incident, the manhunt suggests it was not an accident. The crash – at the symbolic heart of the nation – came just days ahead of a key political congress. And on Monday morning, all seven members of the supreme Politburo Standing Committee attended an event at the Great Hall of the People, across the road from where the incident occurred. Police in Hotan and Beijing declined to comment. Xinjiang government spokesman Luo Fuyong said he could not confirm if the three people in the vehicle were Uygurs from the region. Foreign Ministry spokeswoman Hua Chunying said the incident was being investigated. Security near the crash site has been tightened, with more plain-clothes officers patrolling the area and a fire engine stationed nearby.